Public Safety « Global Market Insights, Inc.
General Dynamics’ latest innovations at Rhode Island quite vividly portray the firm’s powerful stance in tactical communications market. The demonstration, held in the third quarter of 2017, witnessed General Dynamics, a major aerospace & defense company partaking in U.S. tactical communications market share, exhibiting its ability to command, connect & control bluefin robotics UUVs (unmanned underwater vehicles) and third-party UAVs (Unmanned aerial vehicles) with a simulated submarine combat control center ashore via STAPLS (stackable air-powered launch system) at the U.S. Naval Undersea Warfare Center. The principal goal of the firm was to offer novel solutions to the two-way communications problems occurring underwater. Experts claim General Dynamics’ move to have quite an impact on the competitive spectrum of tactical communications industry, given that other companies would be emboldened to brainstorm an even more innovative range of solutions. The introduction of state-of-the-art technologies such as magnetic ear canal has helped in effectively promoting a two-way communication in covert & stealth conditions, on the grounds of which this technology finds massive applications in undercover operations, further strengthening the application spectrum of tactical communications market. This business sphere is also a witness to several strategic M&As, which have had a profound impact on the tactical communications industry outlook. Recently for instance, Evolving Systems Incorporation, a U.S. based telecom giant, has acquired Business Logic Systems, a UK headquartered telecom company, in a bid to expand its consumer base across the globe. Furthermore, the deal is slated to help expand Evolving Systems’ managed services platform to effectively offer tactical solutions to clients, in effect, strengthening its position in the regional tactical communications market. Tactical communications have become a vital necessity across war-torn countries such as Syria. The prevalence of internal conflicts in countries like Nigeria has also necessitated the deployment of tactical communication products in the region. In consequence, this intensive demand for tactical headsets, PMRs, and related products would have a profound impact on Middle East and Africa tactical communications industry size, which is expected to emerge as a rather profitable growth avenue for the overall market in the ensuing years. 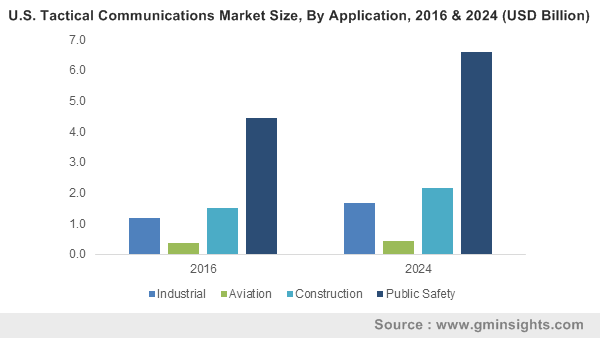 Extensive investments in R&D programs are expected to have a commendable impact on the product landscape of tactical communications market. Having recognized the same, firms such as Bose Corporation, TEA Headsets, FreeLinc Technologies Incorporation, and INVISIO Communications have been pouring in their finances in research and development activities. Bose Corporation, for instance, recently invested quite some amount to develop headsets for the aviation sector in order to provide excellent Bluetooth audio quality and personalized audio arrangement. 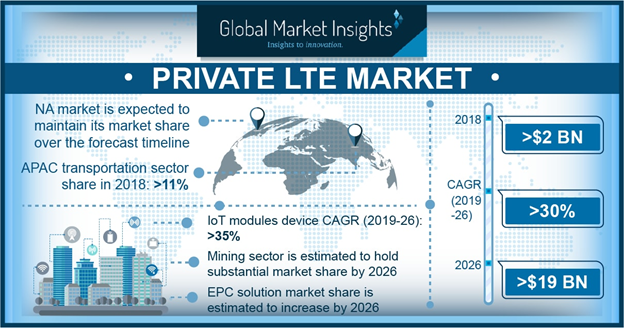 In effect, tactical communications industry stands to gain an appreciable momentum in the years ahead, with a target revenue of over USD 30 billion by 2024. This entry was posted in Electronics and Media and tagged Aviation, Construction, Industrial, Professional Mobile Radio, Public Safety, Tactical Communications Market, Tactical Communications Market Research, Tactical Communications Market Share, Tactical Communications Market Size, Tactical Headsets.